Background: Plants may become drought tolerant by activating specific drought-responsive genes. Many such genes are modified by chemical marks, called epigenetic marks, such as H3K9ac (a specific histone acetylation mark). 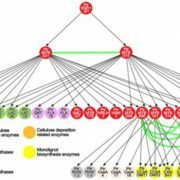 Two key steps are needed to coordinate the activation of the drought-responsive gene. One is an increase in the H3K9ac mark. The other involves a protein element, called transcription factor (TF), that binds to the drought-responsive gene for activation. We know that Abscisic acid-Responsive Element Binding (AREB) protein, a TF, has such a unique capability. We also know that the H3K9ac mark can be increased by a catalytic system containing a histone acetyltransferase (HAT) enzyme. However, we don’t know how these two steps are coordinated for gene activation. 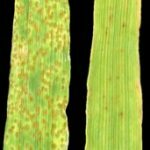 Question: We want to know how H3K9ac modification is linked to AREB TF for the activation of drought-responsive genes. 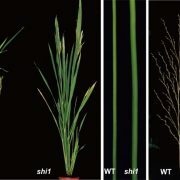 More specifically, we want to know what system catalyzes the increase of the H3K9ac mark and how this system is brought distinctively to the drought-responsive gene through AREB TF for activation. 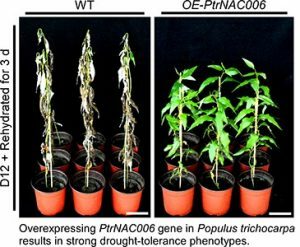 Findings: We identified three drought-responsive genes (PtrNAC006, PtrNAC007, and PtrNAC120) in Populus trichocarpa under drought stress. They had increased H3K9ac mark and the sequences for AREB TF to bind. We further identified PtrAREB1, a TF, that could bind to these PtrNAC genes. We found that while bound to the PtrNAC gene, PtrAREB1 recruited a HAT (termed GCN5) containing protein dimer, ADA2b-GCN5, forming a trimer, PtrAREB1-ADA2b-GCN5. Binding of this trimer to the PtrNAC gene increased its H3K9ac and expression levels. High level expression of these PtrNAC genes in P. trichocarpa resulted in strong drought-tolerance phenotypes. Therefore, we revealed a catalytic system for H3K9ac mark and how this system is specifically brought to the AREB TF for gene activation to develop drought tolerance in Populus. 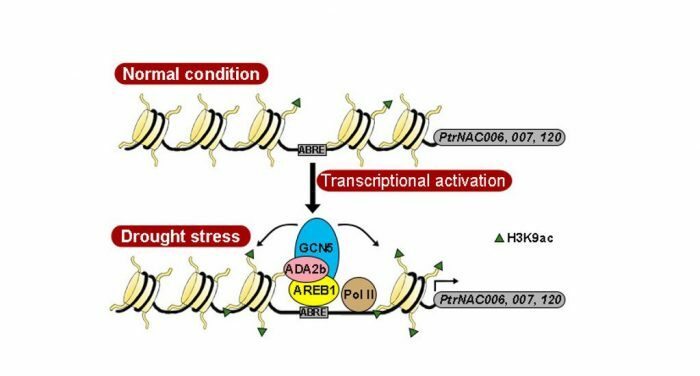 Next steps: This study uncovered a coordinated regulation of H3K9ac and AREB TF functions for developing drought tolerance in Populus. 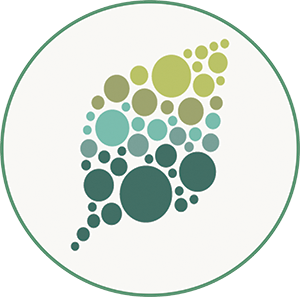 Knowledge of how this regulation interacts with other regulatory systems would be important for future genetic breeding of trees with maximized growth and other properties to support a sustainable ecosystem. Shuang Li, Ying-Chung Jimmy Lin, Pengyu Wang, Baofeng Zhang, Meng Li, Su Chen, Rui SHI, Sermsawat Tunlaya-Anukit, Xinying Liu, Zhifeng Wang, Xiufang Dai, Jing Yu, Chenguang Zhou, Baoguang Liu, Jack P. Wang, Vincent L. Chiang, Wei Li. (2019).